Are you a female who loves to put on her face and look her best? Do you like the element of surprise? If you said yes to either of these, then Truscope’s 100-Piece Pantina Wholesale Bulk Makeup Assorted Cosmetics Lot is going to make your day. What’s in the box? Basically, all the makeup you need to color your eyes, lips and face. 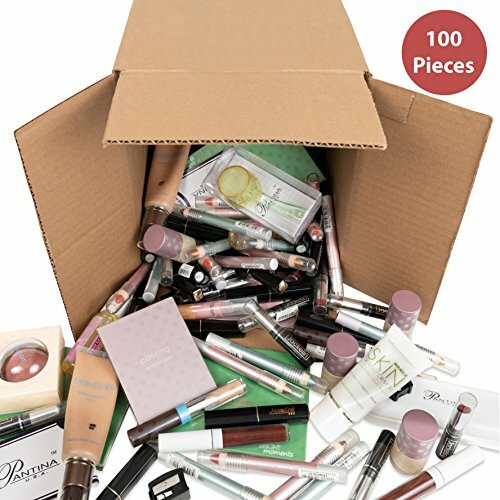 There are 100 items in all, which may include mascara, eye shadow, lip gloss, lipstick, eyeliner, foundation and so much more! This fantastic selection of makeup ensures that you always have a supply on hand. You can even share them with your friends and still have plenty left over for yourself, with a variety of styles and shades to compliment your outfit or personalty on any given day. If you have a hard time deciding what to buy for a special female in your life – wife, mother, friend or sister – this Pantina Bulk Makeup Assortment is sure to please. Not only does it take the guesswork out of deciding what to buy and which color to choose, but it also gives her a huge selection to choose among every single day. As such, it makes a great gift for birthdays, holidays, Mother’s Day, Valentine’s Day and any other gift-giving celebration. In addition to buying for yourself or gifting the whole package to someone else, you can purchase it for a variety of people. Divide up the assorted cosmetics and make up gift baskets for any special occasion. You can also use them to make up birthday party favor bags for tweens and teens, or for women after a bridal shower or bachelorette party. Each recipient is sure to be tickled pink! PERFECT GIFT IDEA. If you have a hard time deciding what to buy for that special lady in your life, this makeup collection is the perfect solution. Ideal for teens and women alike, it makes the perfect gift for birthdays, graduations, anniversaries and other special occasions. AMPLE SUPPLY. Boasting 100 pieces, this makeup set is ideal for any female who prides herself on her looks. You can purchase it or yourself so you always have a supply on hand or divide them up and share them with your friends. VERSATILITY. With this huge assortment, there's sure to be a variety of colors to choose from. As such, it affords her the opportunity to select a different shade to compliment her mood, outfit or personalty on any given day. Colors and styles will vary. GREAT PARTY FAVORS. In addition to keeping or gifting the entire package, you can also divvy up the box to gift to many. They make great favors after a birthday, bridal shower or bachelorette party, or you can make your own cosmetics gift baskets for multiple occasions. If you have any questions about this product by Truscope, contact us by completing and submitting the form below. If you are looking for a specif part number, please include it with your message.